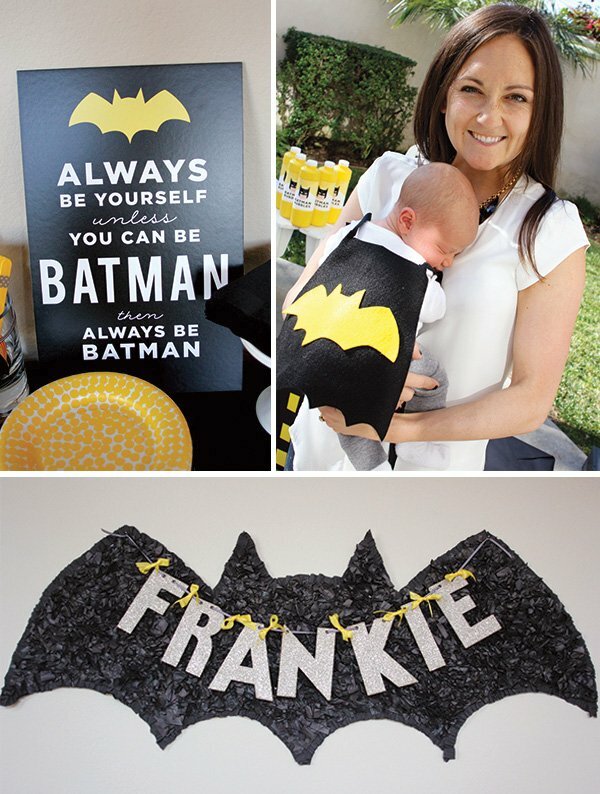 Batman capes (hand-sewn by Karrie) for each little Super Hero… even the very littlest one! Frankie, being a sweet 3 year old boy, is obsessed with all things superhero! 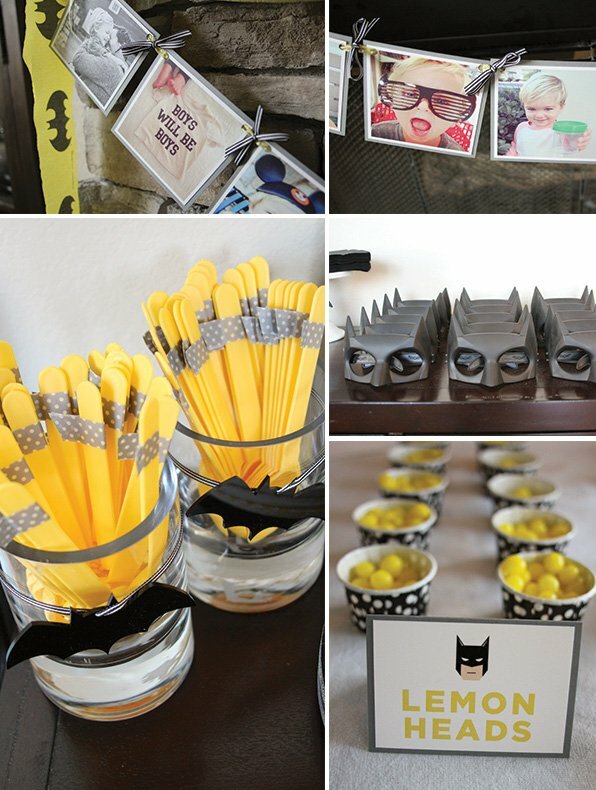 He specifically loves Batman, so Karrie wanted to create a fun party for him with Batman as the focal point! 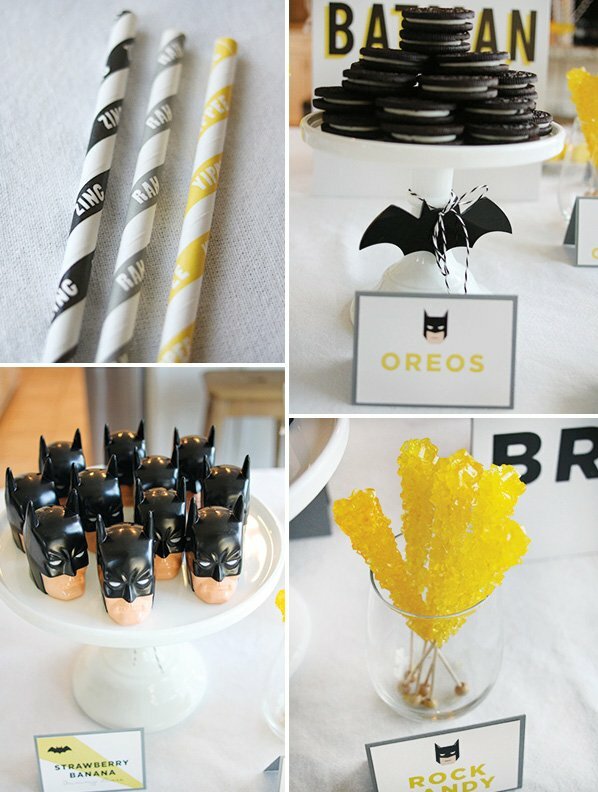 The color palette was pretty typical for Batman — black, white, grey and yellow. 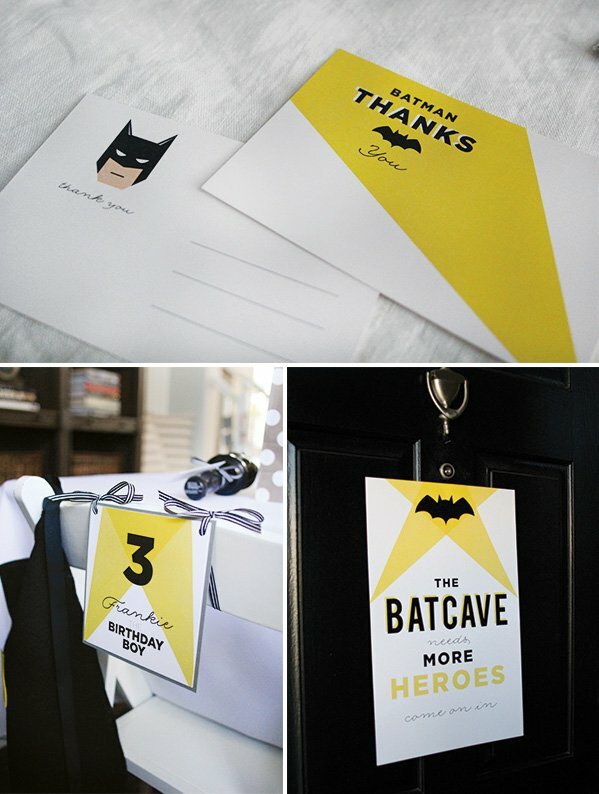 We created a really fun invitation — 2 layers of print (back was a pattern of repeating “Batman” heads), invitation on front with layer of black in between. 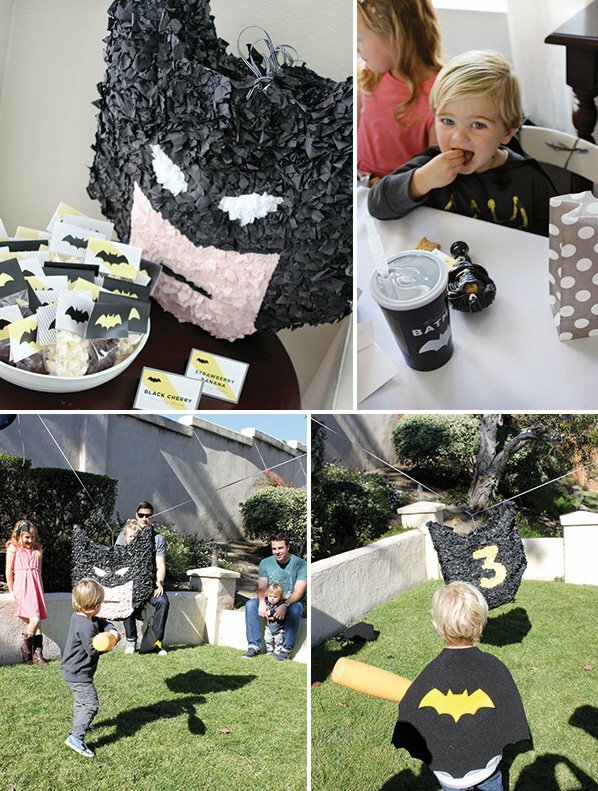 The “Batman” that Karrie created for the invitations was the focal point for everything we designed regarding party paperie. 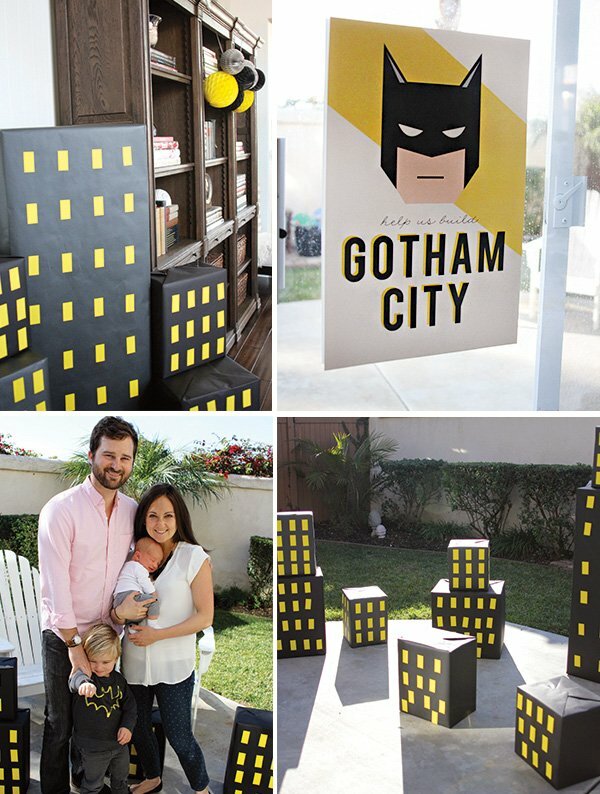 Karrie made the piñata, and she also designed the adorable “Build Gotham City” — wrapped boxes that looked like buildings to create a city in the backyard! This was a huge hit with the kids, along with the piñata. 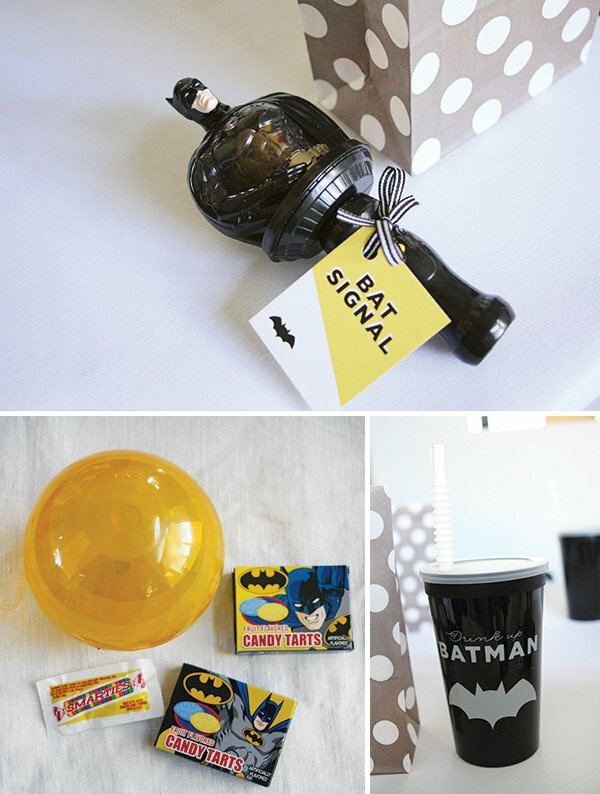 We also had a “Batman Bubble” station. We were lucky to have a beautiful sunny day for all the outdoor activities we had planned for the kids! Party food was all snacks + finger foods, with an incredible array of desserts and cake by Sweet and Saucy Shop. Nothing was left when the party was over! 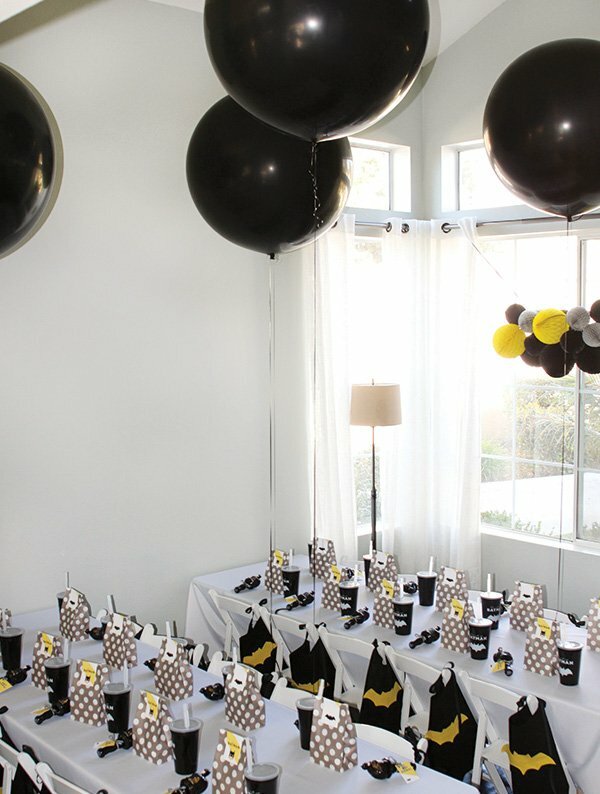 We set two long tables for the kiddos — each place had a Batman favor toy and a cape (hand sewn by Karrie). 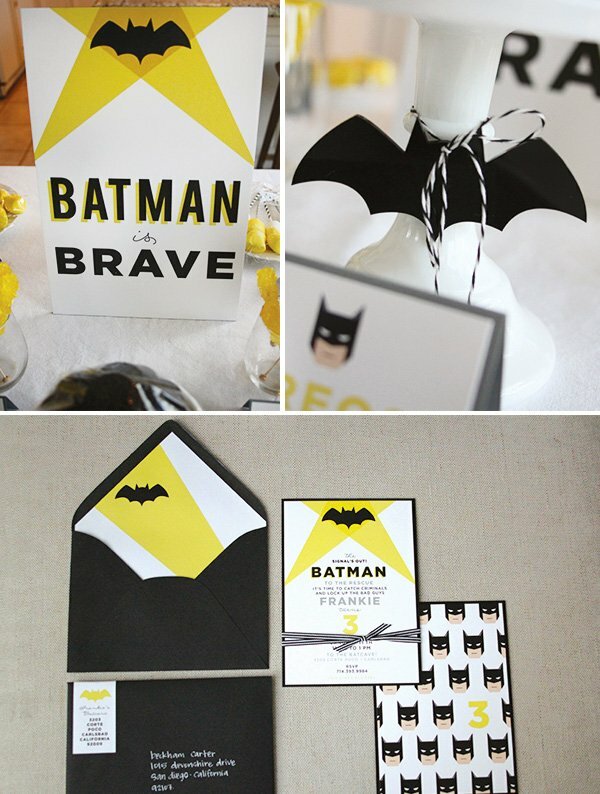 She even sewed 2 tiny capes for the smallest party guests (her newborn son, Harrison, being one of them!). 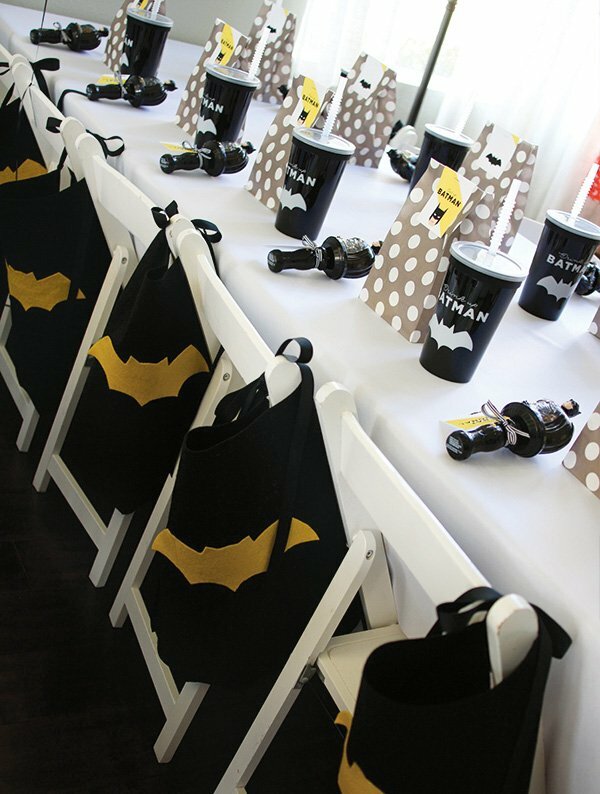 We used darling grey polka dot bags to house the lunches for the kids and had cups custom printed with our batman logo & font. 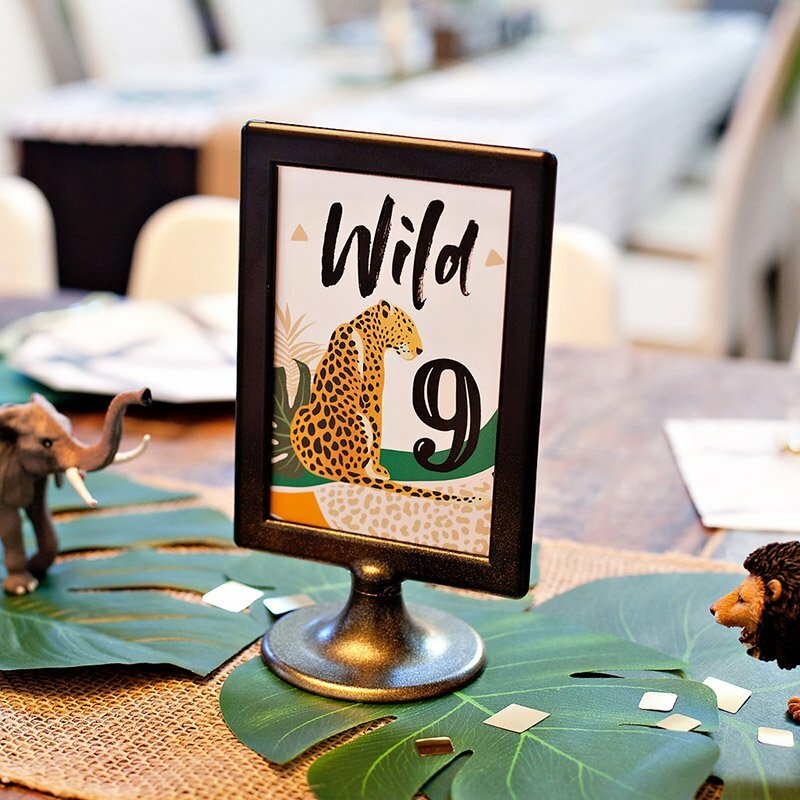 Several photo banners were created to use as decor. Karrie found most of the other items randomly along shopping trips to Target, the Dollar Store & Walmart…and picked them up as she would go! 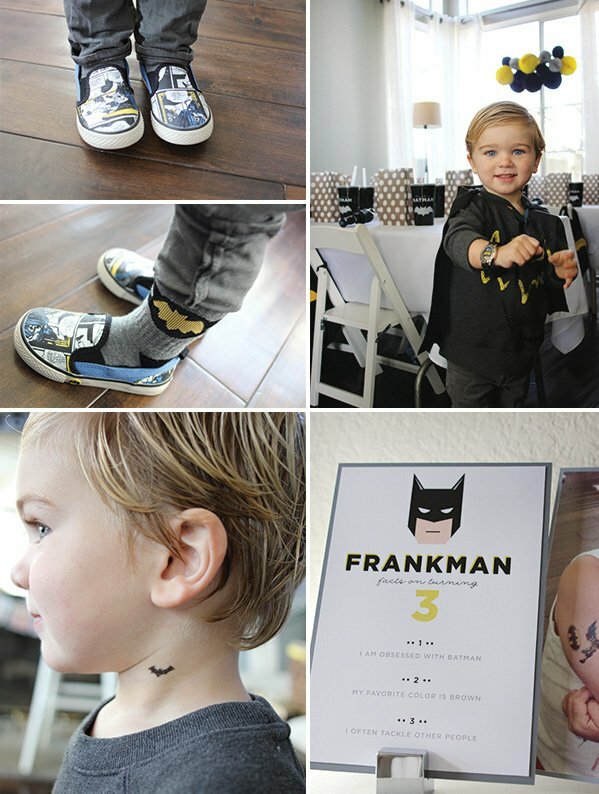 This was such a fun party to create for our little “Frankman,” and he loved every minute of it! Happy 3rd birthday, sweet boy! 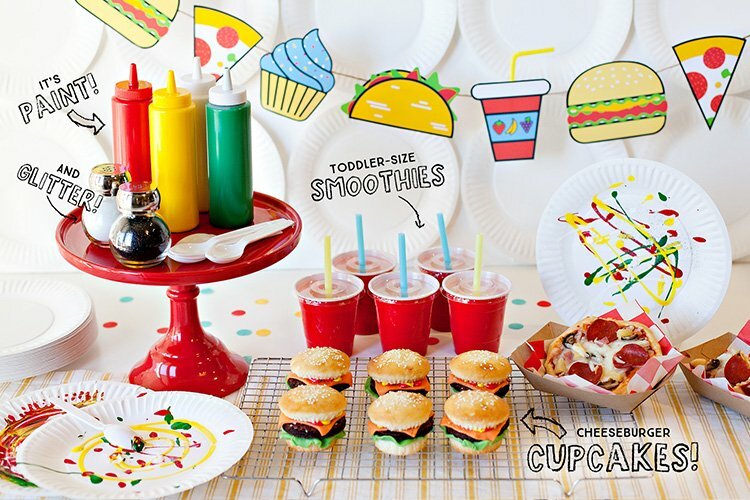 This is the cutest party!! 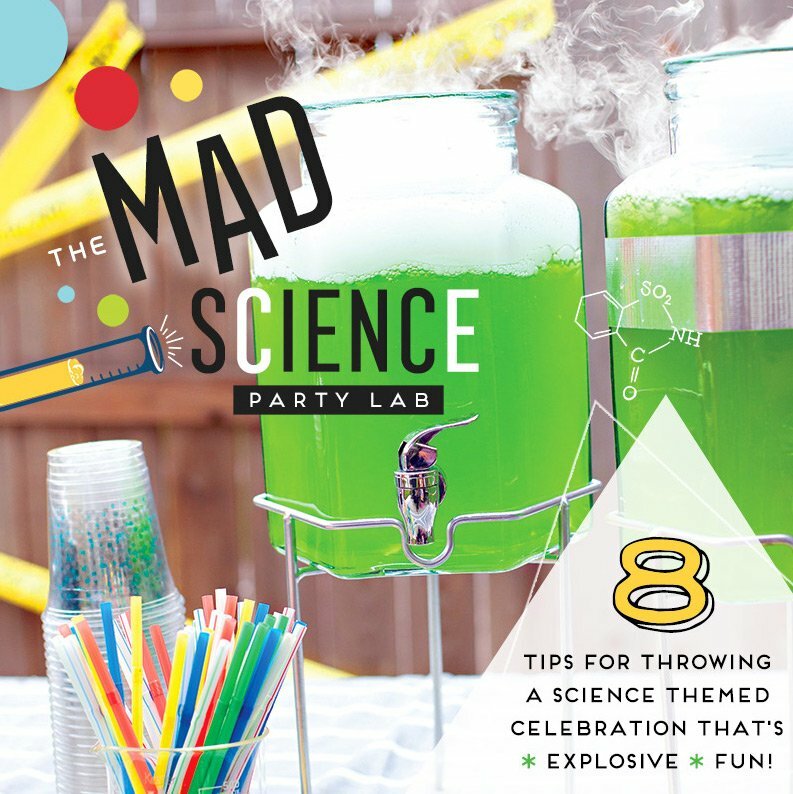 So many fun ideas – love the tissue ball banner and all of the clever signs!! Amazing styling and details! pinned so many pictures. Absolutely love everything! 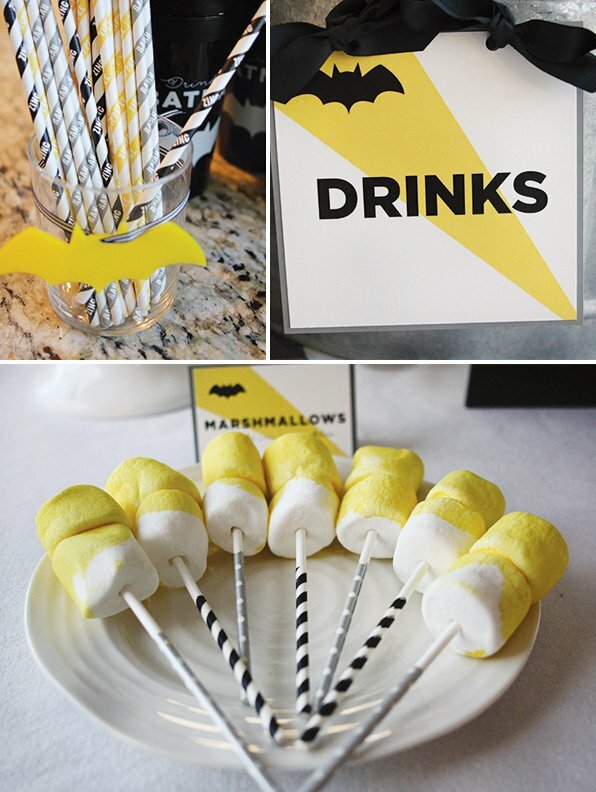 where did they get the batman straws with writing on them??????? 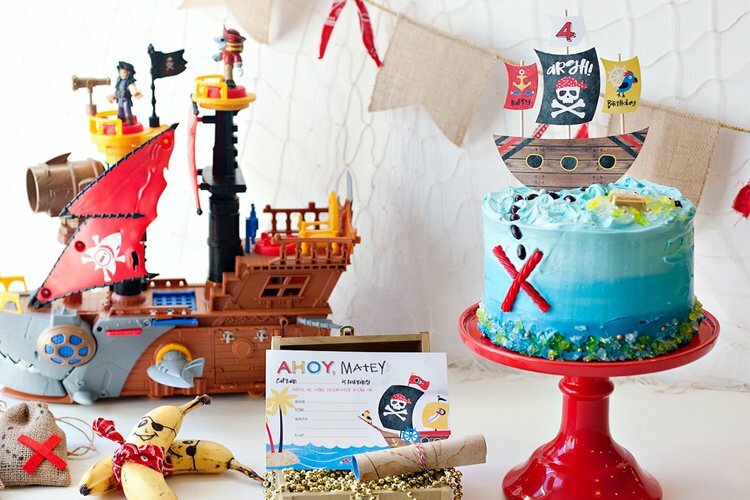 I need those for my sons 21st Birthday – yes 21st! Where did you get the personalized cups from? 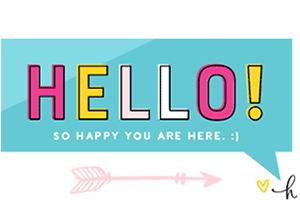 Would you sell your templates for the invites, food tags, etc? 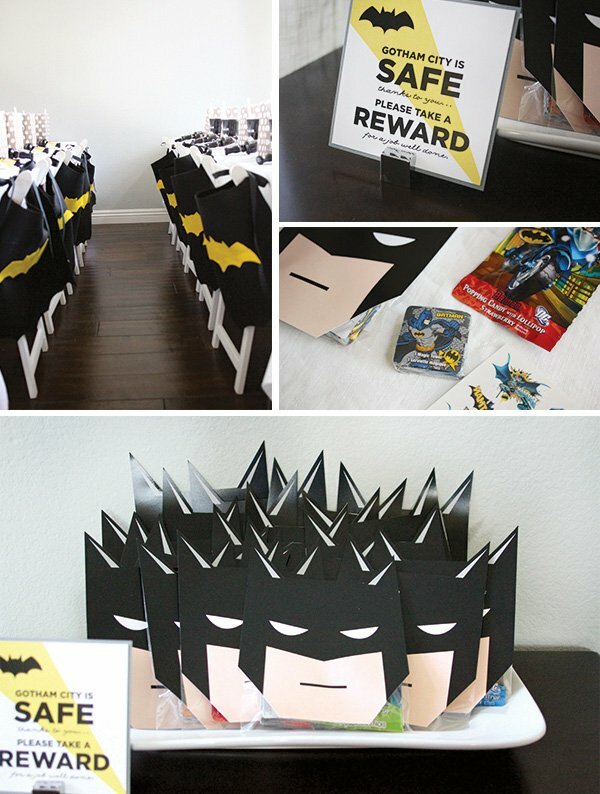 Where did you buy the Batman Masks? Love this!!! Do you have a printable for the candy bag labels? Those are so stinking cute!!! Also approximately how many honey combs did you use for your garland and about what size did it end up??? My son is obsessed with Batman, has been since he was 2 and a half, he's turning 6 soon. 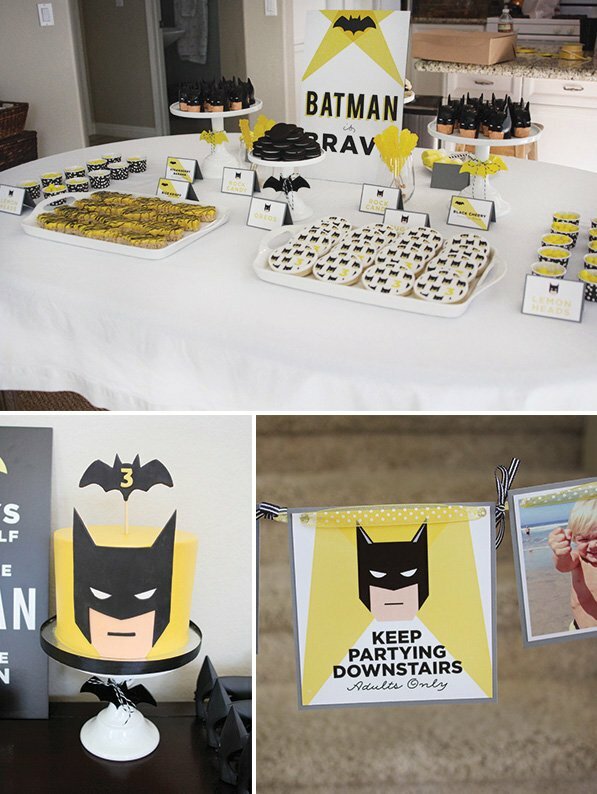 This is the best Batman party I've seen! LOVE it! Great job! Where did you find the Batman head containers? 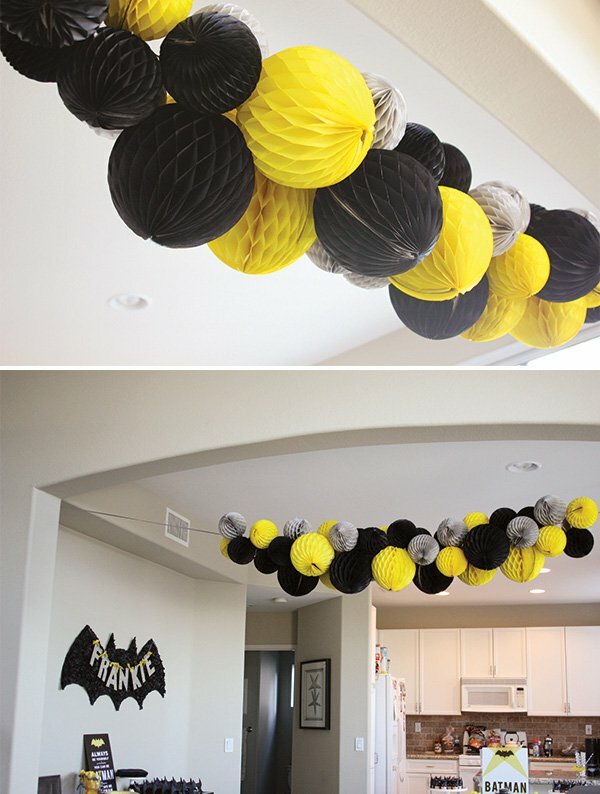 I saw them in another party on pinterest and have been searching desperately for them online with no avail. Any help would be greatly appreciated, my grandson’s birthday is coming too soon! Hope to hear from you. Where did you get the bat signals from? 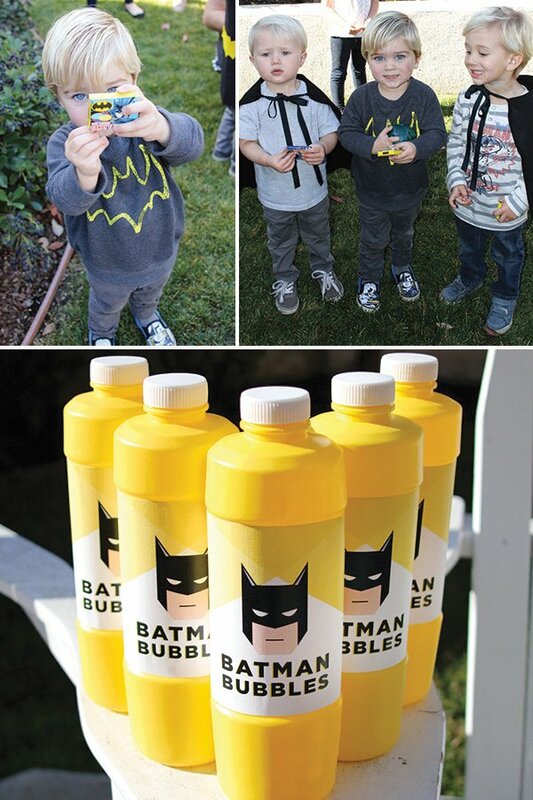 Where did you get the batman flashlights from? Where did you get your invitations?? ?